Editor's Note: Changing Times , a regular feature of Whoosh! , examines episodes of the internationally syndicated television show, Xena: Warrior Princess , and considers the changes happening individually and between the two characters, Xena and Gabrielle, along with discussing the clues offered in each episode about their pasts. 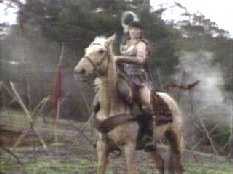 In ORPHAN OF WAR (26/201), Xena deals with several things from her past: the centaurs she once fought, one of her old soldiers, and her son by Borias. Gabrielle learns more about being a true friend as Xena deals with her past and present. Visiting the grave of Borias. "You have things here I can only dream about. Things I would want for my son." Xena is better in how much information she gives to Gabrielle. Xena usually does not like giving information about her past, even when Gabrielle needs to know it. This time, though, she tells Gabrielle that she fought the centaurs, that she was after the power of the Ixion stone, and that Dagnine was once her soldier. Still, she decides not to tell Gabrielle about Solan until he attacks Xena and declares he is her greatest enemy. Even when she tells Gabrielle about Solan, she does not want to talk about it. When the subject is intensely personal and Xena regrets her past choices, she avoids Gabrielle's judgment of her actions. This may be why she hides so many things from Gabrielle in the first place. Some fans were upset that Xena has a son. Considering how many times she has used her body to get suicidal loyalty from her officers, the fact she has a child is not too surprising. What is interesting is that Xena clearly loved the father, Borias. She tells Solan that she sang with him, which she does not often do, and that they were very close once. Xena clearly respects Borias, too, because she says, "He found his way much sooner than I did" and that he saved her from finding the stone and killing off the centaurs. Perhaps that is why she choose to have his child. That Borias went against Xena for the greater good might have been a wake-up call for her. When Xena gives Solan up to the centaurs, she not only says it is to keep him from being used against her, but so that he will not become like her. It did not stop her from being a warlord, but it may have been one of the wake-up calls that kept her from losing all of her conscience and becoming unredeemable. 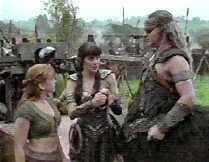 It is also interesting to see how Xena interacts with Solan. When he asks her about Borias, she answers him with the truth: that he was great because he stopped her, but that he once was evil, too. She does not try and paint a good picture of herself, either. She makes it clear to him that if Borias had not stopped her, she would have wiped out the centaurs who are now Solan's friends and family. Xena respects Solan enough to tell him the truth, but hides the fact that she is his mother. The only hint she gives Solan is that she can sing, like his fictional mother. When she resets his broken arm, she holds him like a mother but talks to him as a friend. In the end, Xena decides not to tell him she is his mother, though she comes very close to telling him. 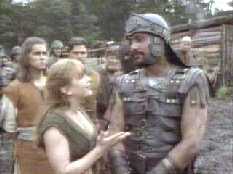 Xena told Gabrielle that she feels like she does not have the right to tell Solan because she gave him up. She sees that Solan already has a family that loves and cares for him, which she still cannot provide for him. Also, she has already taken his vision of a totally heroic father from him. Her being his mother would take away his loving "mother", too. So she allows him to forgive her for her past crimes that he has come to terms with, and lets him remain free of all she would bring, both good and bad. There are a few more interesting things in this episode. First, Dagnine did not know Xena had a son, yet he was a soldier in her army. Xena and Borias must have kept the child a secret so he could not be used against them. If Xena remained a "tent commander" and Borias was the one actually making sure the orders were carried out, then it could have been hidden fairly well. Also, despite the fact Xena does not want Solan to be a warrior, she compliments him on not freezing in a fight. Either she is taking to heart letting Solan choose his own way, or in all fairness had to compliment him on the skills he has. A small final point is that when Xena was fighting the centaur-Dagnine, she still throws her chakram to kill a soldier fighting Gabrielle. The thing was that Gabrielle was holding her own just fine. On the other hand, earlier, she sends Gabrielle to go get the centaurs to come help save Solan. It seems like Xena trusts Gabrielle to get help, but not survive in a fight without her, yet. "She always does what's right, even if it hurts her." When Gabrielle learns about Solan, she immediately berates Xena for leaving him, even if it was to protect him. Gabrielle thinks Solan deserves to have a mother. Later she even tells Solan she does not understand how people can hate Xena so much, because she has really only seen the good Xena. Still, despite the fact Gabrielle thinks she knows what is right, she apologizes to Xena. She realizes that she should have been less judgmental and more of a friend, which is what Xena needed. Gabrielle is slowly learning how to be a friend to Xena while keeping her moral code. Still, Gabrielle keeps giving Solan hints that Xena is his mother. She tells him that he is ahead of the game when he says he cannot do backflips. She also tries to get Solan to forgive Xena, though she would probably do that, anyway. Still, she just cannot stand back and let Xena decide to tell Solan or not. Gabrielle's attitude about her staff is interesting. She tells Solan that she is not a warrior, even if she fights to protect herself. She says that a sword makes you a target because the edges threaten people, where as a staff has no edges and will not provoke a fight. She has also learned enough now that she offers to teach Solan how to use a staff. Despite that, she still is not good enough defend both Solan and herself from multiple attackers. Finally, Gabrielle has obviously learned more about centaurs. She knows the totems are centaurs totems in the beginning and knows that centaurs are easy prey in the woods. She also just hops on a centaurs back when they are about to take off. Her confidence and knowledge is growing. Xena tried to take the Ixion stone "ten years ago." Xena gave up Solan into centaur care for "nine years." I would take this to mean that near the end of the 'ten years ago,' Xena started fighting the centaurs with Borias. After a few months, Borias turned on her, she gave up Solan, and she stopped fighting these centaurs. REMEMBER NOTHING (26/202) mainly revolves around Xena learning how much good she has done. We also get to learn about what Gabrielle is capable of being, or at least could have become. "On second thought, that would have been something to see." Visiting the tomb of Cyrene. Xena goes to the temple of the fates to honor Lyceus every year on the date of his death. Xena feels that it is her fault he died. She tells Gabrielle that he followed her into battle, which is why he died. Also, the fact she goes to the temple every year but could not care less where Toris was probably shows she was much closer to Lyceus. We learn that it was Xena that insisted that the village to stay and fight, though it was Lyceus who taught her how to fight and agreed the warlords had to be stopped. Also, when Xena is going through her jewelry box, she pulls out and kisses a ring. It is a ring where poison can be kept, usually used for suicide if a woman is wearing it. Did Xena used to wear it into battle, or was it a mark of the days before she fought? She also pulls out a wedding bracelet. Shortly after, she runs into her fiance, who is a whining, lazy, 'go along to get along' wimp. Xena may have always had a warrior spirit, but man, have her tastes changed! Despite the fact that her fiance betrays her, Lyceus, and Gabrielle in an attempt to protect her, he later wakes up and goes to save them. Maybe it was that potential in him that she loved. Things have changed in this reality, including the death of Xena's mother and Gabrielle being a slave. Still, Xena refuses to break the spell. She feels that her mother would rather be dead than have the shame of her daughter becoming a warlord. She also says, "This is Gabrielle we're talking about. How different can she be?" All the way up to the end she stubbornly thinks Gabrielle can be changed back into an innocent. In the end, though, she decides to go back. All the people she had saved before were dead and enslaved. More than that, she realizes that Lyceus would continue fighting warlords until he died, and Xena could never stop that. Xena still holds out hold when Gabrielle says she does not know whether to hate her or to thank her for her short freedom. When Gabrielle kills a warlord and clearly enjoyers it, Xena realizes her friend is gone. So she goes back, not only having seen the good she has done, but she is able to save the boy's life she killed in the beginning of the episode, as well. One final interesting point: When Xena first is in the alternate reality, Lyceus tells her to go home. Xena replies, "I have." Ever since SINS OF THE PAST (01/101), she has never been able to go home, no matter how much she wants to. For a moment, she finally thinks she has. If that is home, where her family is alive and she has never killed, then can she ever truly go home? "You gave me hope. You made me think maybe it wasn't too late for me." Xena finds Gabrielle a pathetic urchin in this alternate timeline. The Gabrielle we know is innocent, trusting, has a code against killing, and would never give up on anyone or anything. Here Gabrielle has been a slave for a year. She ran away, but was whipped until now she will not even try. Still, she keeps on with her petty revenge when she spits in the warlord's drink and has a dog lick his bread. In the end, she even takes the opportunity to kill her master and enjoys her revenge. She also is very hard, has learned not to trust, and is skeptical of everything and everyone. When Xena describes her friend, Gabrielle makes sure to smash that image of herself. She even tells Xena that at least as a slave, she had forgotten what it was like to be free. She almost preferred that to having hope and having it taken away again. She becomes everything the other Gabrielle is against, just because things went differently. Despite what Xena and Gabrielle would like to believe, Gabrielle does have the ability to become like Xena. Still, even when she was a slave, she still had enough fight left in her to finally decide to help Xena and Lyceus against the warlords. Xena and Gabrielle are going on a trip to honor Lyceus, which Xena does every year on the date of his death. Gabrielle has never been on this trip before, so that means Xena and Gabrielle have been together for just under a year. Lyceus died 11 years ago, exactly, when fighting against Cortese. In GIANT KILLER (27/203) Xena has to fight against a friend she owes her live to. Gabrielle learns that her friendship to Xena will not always keep her alive. "Your war is over now." Visiting the giants' burying ground. Xena has changed much in this episode. She owes Goliath her life, because he saved her while his family died. First Xena tries to talk him into fighting on the right side. When he will not give up his revenge, Xena stands against him, even though she owes him her life. As she says, "I owe you my life, Goliath, not the lives of others." One interesting thing we see once again is that when Xena chooses a side, it becomes the 'right side.' This time she actually takes the time to talk and find out the Philistines are trying to enslave people, which she does not care for. Still, one day she might just jump in and protect the wrong side. Another thing is that Xena, yet again, calmly takes over command of an army of people who hated her mere moments ago. She manages to change their opinion and is such a commander that people allow her to take over. Still, Xena knows when someone else needs to get the glory to be really helpful and is willing to hand it over. Finally, despite the fact Xena owes Goliath and came up with the plans that caused his death, she refuses to take on his revenge debt. She has changed so much that now she refuses to take the path of revenge, even for someone she owes so much. Gabrielle tries to talk sense to the Commander of the Philistines. "Stories are meant to be told. Stories tell us who we are." Gabrielle is getting a rather overinflated confidence. First, she challenges a group of soldiers to take on "someone who can defend themselves", meaning herself. Then she steals the guy's food right out in front of him, then tries to talk the guy out of killing the prisoners when he catches them with the food (and trying to escape). When she nearly gets her head cut off trying to stop the execution, she finds out Xena's friendship to her and her innocence will not save her from a person with no morals, though. Gabrielle's fighting skills are getting better. When Xena frees her hands when she is about to be executed, Gabrielle flips over David, grabs the axe, and frees David. She then manages to hold a soldier back without slicing him until he drops his staff in favor of the axe. Gabrielle, of course, takes the staff and beats him silly. She also mounts up behind Xena pretty quickly. Either they have been practicing that move or do it rather often. Also, Gabrielle starts to fall for a gentle story-teller with a brave heart. She seems to like anyone who shares her passion for telling stories or shares her code of only fighting to defend themselves. It rather seems to go against Gabrielle's code when she steals food. However, because David tried to help her, she seems to have already decided his side is the right side. It looks like stealing from the enemy is not against her code. Finally, Gabrielle has the art of comforting down. When Xena is staring out into the stormy night, feeling guilt over fighting her friend, Gabrielle just holds her hand. Then again, fighting a friend who chooses the wrong side is not against her code of honor. She stood up to Xena in TIES THAT BIND (20/120). Still, Gabrielle is getting better at supporting Xena when she needs it. Argo, she of many skills, shows off another one. At Xena's whistle, she charges down soldiers and chases them away from the fighting. She's done this in THE GREATER GOOD (21/221), but she did it without the whistle that time. Goliath left Xena's army ten years ago.